What the expanded airport should have looked like in 2018. 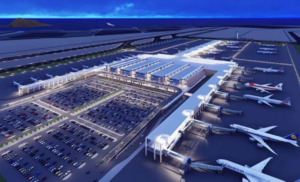 For 10 years SPJC/Lima’s Jorge Chavez airport has been desperately waiting for a promised US$1.5bn expansion. With the rapid growth in the airline industry in Peru over the past few years, it seems the airport authorities are starting to struggle to provide enough capacity, and they are now trying to make it as difficult as possible for anything other than the commercial airlines to operate there! In AIC (10/18), which has been in effect since Aug 2018, the airport has said that no more technical stops will be permitted at the airport. It also outlines significant slot/time restrictions for GA/BA operations. Why they are doing it? You can find the full information here but we have listed the main operational details below. Tech stops are “forbidden” for “commercial flights and general, national and international aviation” effective 15 August 18. Maximum stay of 2 hours on the civil apron for GA/BA flights. This is counted “from the time of placing chocks.” After two hours, the aircraft must be transferred to another apron, parking area for aircraft or hangar, or must go to a suitable alternate airport. The recommended airport to re-position to is SPSO/Pisco. It has an ILS and a 9900’/3000m runway. It is 115nm away, and open H24. General aviation flights are limited to two operating periods every day. “Flights must perform their take-off and landing” between 0000L-0430L (0500UTC-0930UTC) or 1300L-1859L [1800UTC-2359UTC ]. The 2-hour maximum ground time still applies, and coordination of ground services should be pre-planned in advance to comply. If you have any further knowledge or recent experience to share, please let us know!